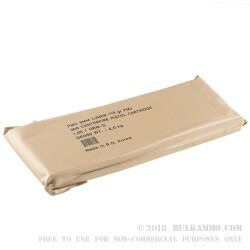 An excellent package to stock up on and store away for year round shooting, or if you’re into it: prepping for the Zombie Apocalypse or any other SHTF scenario. This 3 battle pack case load is sealed for environmental variables and offers 3 x 300 round battle packs for a steal of a price. 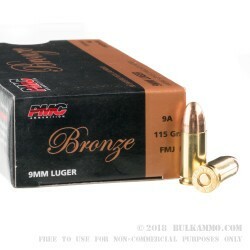 The 9mm conical shaped bullet at 115 grains is a classic FMJ load for the 9mm Luger which is about what any shooter would want to have if they had a choice for range ammunition. 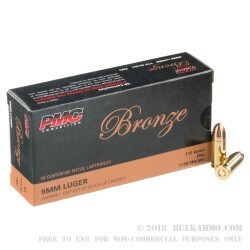 Feeding and reliability are proven, the speed is good and the brass is reloadable: what is not to like? The 9mm 115 grain is about the most versatile 9mm load that exists, and the price is sufficiently low to make it an easy choice. 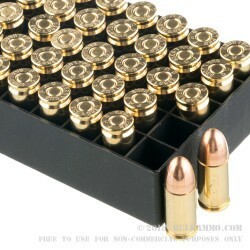 900 rounds in all, with a good quality load that has been a proven reliable performer for millions of shooters world wide. 1150 fps and 340 ft. lbs. 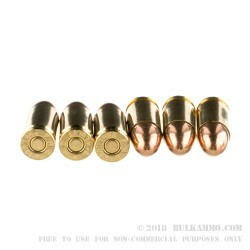 of energy out of the muzzle makes this a potent round; perfect for breaking in tight new 9mm weapons, or to help ensure functionality for those guns you can never quite tame. Suitable for use in any 9mm Luger firearm.